My third children’s book is released today and I’m very excited! It’s a Halloween story but not a classic one. 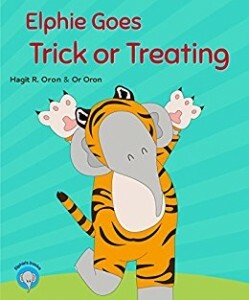 There’s nothing scary, except for Elphie’s costume. Well, Elphie finds it scary because he can’t recognise himself. Has it ever happened to you? I don’t like to dress up. I don’t like masks. I like to be who I am and I hate it when I need to disguise myself in looks or in words. So Elphie is actually me. I’m also Elphie’s mother, always caring and worrying about my kids. It’s great that I get to work on these books with my daughter. I love working with her and seeing the stories come alive with her illustrations. It’s like seeing the world through her eyes. Now, when she’s in her twenties, I try to restrain my overprotectiveness and let her solve her issues, unlike Elphie’s mom who comes up with a creative solution to Elphie’s costume crisis. I would like to be a little more Phante, Elphie’s little friend. She is brave and direct and she’s not afraid to speak what’s on her mind. She communicates the things that bother her very clearly. I wish I could do that. Well, I do share Phante’s sweet tooth. That’s totally me. Anyway, here is a link to the book. It’s only $0.99, but I’m giving away some free copies to my email list subscribers, so you’re welcome to join! You’d also get my first book for free.